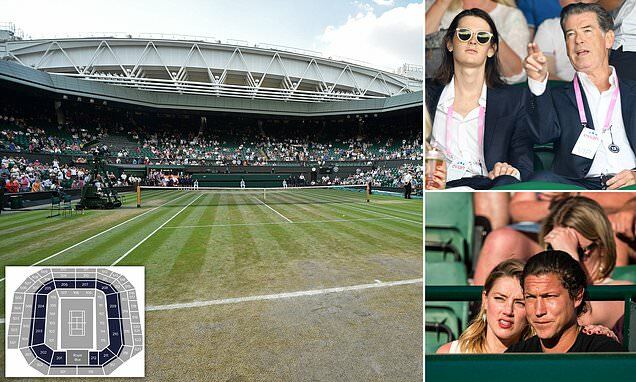 The world's mega-rich will compete for access to exclusive Wimbledon seats worth an estimated £100,000 each next week. The 2,520 debentures - five-year Centre Court passes for 2021-25 - will be on sale at 10am next Thursday, and are expected to cost twice as much as the £50,000 passes for 2015-20. Members of the public have to enter a public ballot or queue for up to two days outside the south west London venue to access tickets for the tennis tournament, but the costly debentures guarantee seats for at least the first 13 days of the Grand Slam tournament, and holders can legally resell their tickets on secondary markets. Debenture holders have made tens of thousands of pounds a year by selling access for championship days - with some even trebling their money by reselling the entire debenture, reportedly making the seats a more valuable investment than gold. Marketing manager for the resale service Wimbledon Debenture Holders Claire-Estelle Bertrand told the Guardian: 'They are the most sought-after tickets in the world.